Not only can window coverings affect the amount of light and privacy in your business space, the right ones can help save on energy costs, improve employee productivity and create a better atmosphere for your customers. Are there restaurants you won’t patronize because they’re so cold it’s uncomfortable to eat there? Or stores that are so stuffy and hot that you just run in for a specific item and get out as quickly as possible? Do your employees nod off after lunch when the temperatures get too warm? Does your conference room become an extreme environment as the meeting progresses: sauna or sub-zero freezer? Is glare driving customers away or making your employees miserable? 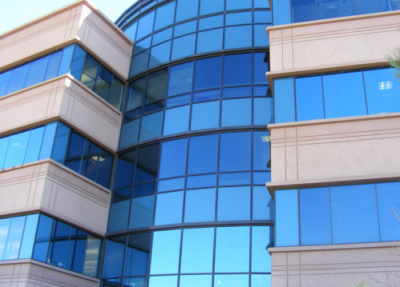 Depending on the type of business, commercial buildings can be home to employees, or employees and the general public (your customers). If your business is serving the public, ensure that the space is comfortable, functional and safe, so people will stay longer. For employees, the environment must also be safe, functional and comfortable. Natural light has powerful effects on health, impacting mood, alertness and sleep habits, so many modern buildings have walls of windows to let in beneficial natural light. But an expanse of windows can also generate excessive heat during summer and cold during the winter, driving up energy costs as you try to maintain a comfortable year-round temperature. Used alone or paired together, each of these solutions can improve the energy efficiency of your business by giving you more control. Adding motorization to blinds, shades, shutters and drapes increases ease of control with wall-mounted or handheld remotes as well as timers and sensors that automatically respond to temperature and time settings. Contact Budget Blinds on Vancouver Island to learn more about how their products can help to improve your commercial space.